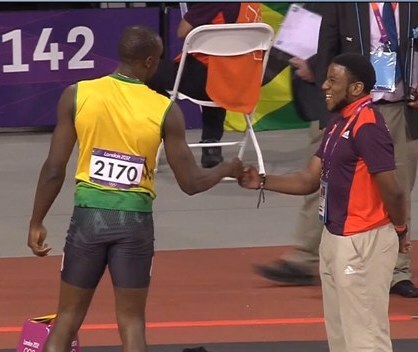 Usain Bolt fist-bumps a volunteer. Do you know why the Olympics rock? At work over the past two weeks, we've had the Olympic Games on the TV in the background. I found it difficult to concentrate, actually. By craning my neck slightly, I could see the greatest athletes from around the world competing together in one city. Each athlete brought a story; there's no way to reach that level of athleticism without etching a novel in blood, sweat and sacrifice. God, the drama. Some of my co-workers didn't care for the Olympics. "Whatever." "They're just some games." "It's an exercise in sponsorship, advertising and government-self-congratulation." Perhaps that last one is true if we let it be true. It's possible to miss the message of a ritual (any ritual, from Christmas to a funeral to a debut) for the packaging that accompanies it. There is no doubt the Olympic Games are tainted commercialism. You can focus on that taint (hah!) or you can focus on the heart of the ritual. And the heart of the Olympic ritual is an invitation for humanity to rise to excellence, both physically and spiritually. Really, I find the mental fortitude, commitment and peace in some of the athletes a thousand times more moving and desirable than their athletic prowess. And it's achievable: These young women and men prove it is every four years. Does that make me a sucker? Perhaps. To borrow someone else's phrase, I'd rather be a sucker than a cynic. I'm with you. Plus I like a quick, every-four-years immersion in the odd sports: weightlifting, shotput, judo.